High-throughput phenotyping platforms (HTPPs) provide novel opportunities to more effectively dissect the genetic basis of drought-adaptive traits. This genome-wide association study (GWAS) compares the results obtained with two Unmanned Aerial Vehicles (UAVs) and a ground-based platform used to measure Normalized Difference Vegetation Index (NDVI) in a panel of 248 elite durum wheat (Triticum turgidum L. ssp. durum Desf.) accessions at different growth stages and water regimes. Our results suggest increased ability of aerial over ground-based platforms to detect quantitative trait loci (QTL) for NDVI, particularly under terminal drought stress, with 22 and 16 single QTLs detected, respectively, and accounting for 89.6 vs. 64.7% phenotypic variance based on multiple QTL models. Additionally, the durum panel was investigated for leaf chlorophyll content (SPAD), leaf rolling and dry biomass under terminal drought stress. 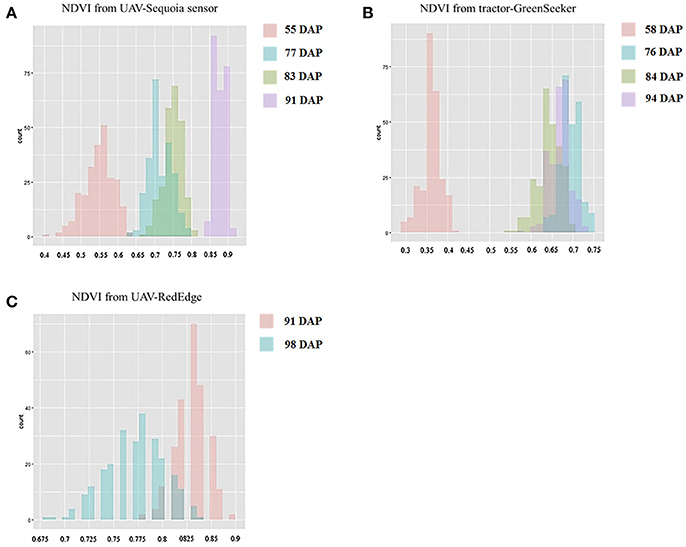 In total, 46 significant QTLs affected NDVI across platforms, 22 of which showed concomitant effects on leaf greenness, 2 on leaf rolling and 10 on biomass. Among 9 QTL hotspots on chromosomes 1A, 1B, 2B, 4B, 5B, 6B, and 7B that influenced NDVI and other drought-adaptive traits, 8 showed per se effects unrelated to phenology.